The Indian festival of Basant (or Vasant) Panchami marks advent of spring season (वसंत ऋतु). It is the first day of spring season and it always falls on the fifth day of Hindu month of Magh (Jan-Feb), in the waxing phase of the moon (Shukl-pakchha), there is no chill of winter, weather is pleasant and nature is in it's full grandeur. 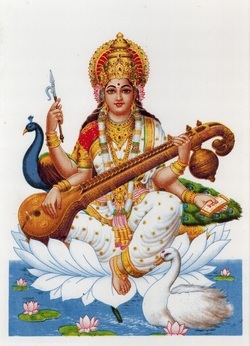 According to the prevalent custom of India, people worship Goddess Saraswati on this occasion. Because She is the goddess of learning, wisdom, fine arts and purity. She wears pure white sari, sits on a white lotus and a white swan, which denotes the simplicity, brightness and serenity of Goddess Saraswati. She holds a musical instrument called Veena, which indicates that She is the goddess of Music and fine arts. The peacock is the sign of love and sweet sentiments. Vedic Scriptures in her one hand indicate her personality as a Goddess of wisdom. Thus She is the abode of all kinds of knowledge, arts, majesty and serenity. Most of the schools celebrate Basant Panchami as Saraswati – poojan day also and distribute yellow sweets and wild berry (बेर). People celebrate the pleasant season of Basant (or Vasant asant) with cultural programs, commencement of Education, enjoyment of natural beauty etc. That is why they worship Mother Saraswati first to get Her blessings to attain all this bliss by Her grace without any inauspicious occurrence. Now the question arises why the exclusive devotees of Shri Krishna celebrate Basant Panchami. As I explained before, it is time of pleasant weather and magnificence of natural beauty. Shri Radha Krishna are personified divine love. They descended on the earth to teach and impart selfless divine love to the deserving souls. So it is an ideal season for the love-pastimes as well. Now the chief Gopis, Lalita, Vishakha etc. 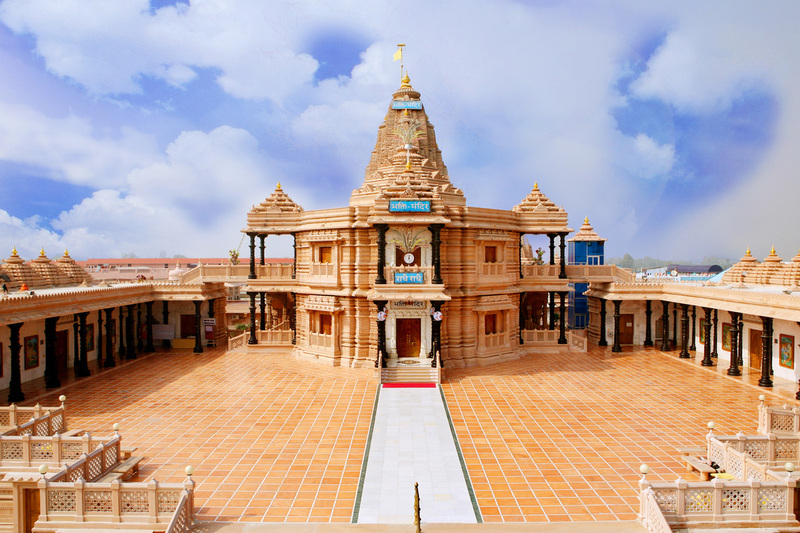 would plan various pastimes in various gardens for the pleasure of Shri Radha Krishna in Divine Vrindaban. Shri Radha Krishna with their devotees will jaunt in various groves and perform Ras dance in divine ecstasy. Thus Shri Radha Krishna shower their love upon their beloved devotees from this significant day. Second, this day is the herald of Holi season also. Holi is a festival of love. So the devotees start making plans of playing Holi with Shyam Sundar and Radha Rani according to their choice. The play of Holi starts on the day of Basant Panchami in Braj. The devotees decorate the deities in light yellow (Basanti Color) garments, flowers and ornaments. They also wear clothes of the same color and cook variety of food in light yellow color. They play holi of red powder with the deities (red color is the symbol of love), offer basanti flowers, sing bhajans and dance with joy. We, all the followers of Shri Maharaj Ji, also celebrate it with the same fervor in our Ashrams to please our Guru and Shri Radha Krishna.